Lately I find myself wanting to be tan more and more, but I don't want the damage that comes with too much sun exposure, naturally. So I've been experimenting a bit with sunless tanners. Since I started competing in dance competitions where a tan is part of the uniform, I find myself drawn to a more glowing skin tone, though what I use when I compete washes off immediately. 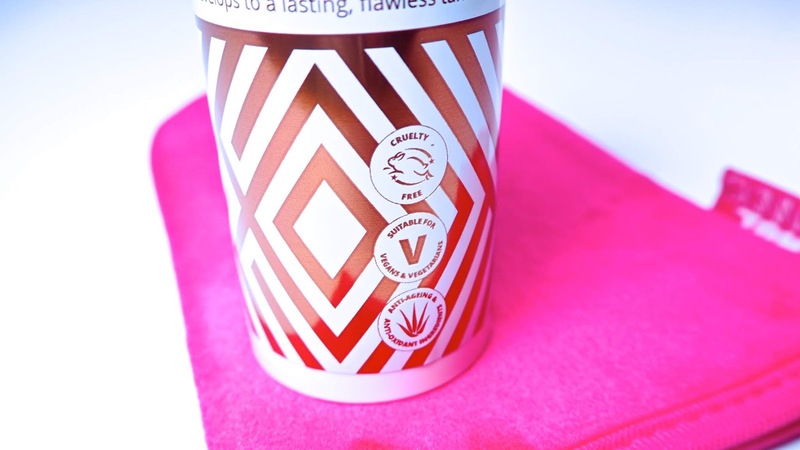 When I was offered the opportunity to try Skinny Tan Wonder Serum, I jumped at the chance. It sounded like a product that is easy to use for a tanning novice like myself and like it would be good for my skin too. Wonder Serum isn't your average sunless tanning option because it's a tan and an anti-ageing treatment combined. Suitable for the face and body, this silky serum can provide results that last up to 10 days and it's suitable for regular tanners and newbies alike. The process starts with exfoliating. I used the Skinny Tan Exfoliating Mitt all over my body, focusing more attention on the dryer areas like knees, elbows, feet and ankles. (Just a tip about this mitt... The brown side is for exfoliating and removing dead skin before tanning. The orange side is for high level dermabrasion, meaning that you can use it to remove excess tanning from problem areas later.) Following exfoliation I lightly moisturised those same problem areas as directed before applying the product. As for using the Wonder Serum itself, I applied it with the Skinny Tan Dual Tanning Mitt as instructed. I've been using this mitt for ages as it's perfect for applying pretty much any tanner whether it's something more lasting like Wonder Serum or the wash-off tan I use for dance competitions. It's a velvety, smooth mitt that's super easy to clean and I'm a big fan of this product. At first the process was really easy and the serum glided on so gently. It's slightly darker than my pale skin tone so I was easily able to see where I'd applied and where I hadn't. As an area started to dry however, it became a bit difficult to blend in with another area, which makes me think speed is important for this process. Obviously after applying to my first leg, I found areas I'd missed, then tried to cover those spots and found myself wrestling a little with the application process. Nothing too terribly stressful and this wasn't at all a dealbreaker for me. I think however because of this issue, I kept layering it on in an attempt to blend, so even though it's supposed to dry in just 2 minutes, it didn't dry fully for over an hour and even after all that time, it came off on my socks and clothes. I imagine these things are to be expected, but in the interest of full disclosure, this was my full experience. The colour I was left with after application was a golden, shimmering tan. I looked like I'd been on a sunny beach holiday and it was so nice to have a bronze tan after months of looking so pale. The serum develops over 8 hours, so I applied it on a Friday evening before heading out to the cinema, slept in it and washed it off late the next morning. It's important to note that it did come off on my clothes, so if you're trying it, I would suggest some black, breathable clothing like leggings and a t-shirt or something like that. The product smells nice and not too strong unlike some others I've tried, so it didn't bother me to wear it for the whole night. The only drawback is that it starts to settle after about an hour or so. I had darker deposits around any dry patches like knees, elbows and ankles as well as in my cleavage. These deposits rinsed right off when I showered, but I wouldn't suggest using this right before you're going out somewhere special. It's best to try it on a night off at home when you don't mind if you have orange elbows. Once the whole process was done and dusted, I was left with a beautiful, bronze, glowing tan. It wasn't perfect, but it was pretty darn close and I think with some practice I could get better at it for sure. The tan has lasted a lot longer on my legs and torso area than anywhere else. It didn't take as dark on my arms and chest as it did on my legs for some reason, so in future I might double the applications on those areas. The tan completely came off my feet after about 5 days, which I'm guessing might have something to do with socks I wear to the gym and dance classes. As it's come off, there are a few patches that I think could easily be sorted with the exfoliation mitt, though I'll admit that since it's not sandal season, I've been too lazy to try. I would suggest taking care how you apply this to your feet if you are keen to wear sandals because it can get quite dark around the skin on your heels. I've now had my Wonder Serum tan for about a week and a half and while my arms and chest have gone back to normal, my legs that are usually a pasty white colour have remained a light, golden tone. They look more glossy and toned than they normally do and I've loved wearing mini skirts with no tights while having this tan! As for the anti-ageing part of the deal, that remains to be seen to be honest, but I guess it probably can't hurt. When it comes to preventing premature ageing, I'll take all the help I can get! Depending on what level of tan you're after, I think most people could probably get away with applying Skinny Tan Wonder Serum about once a week. 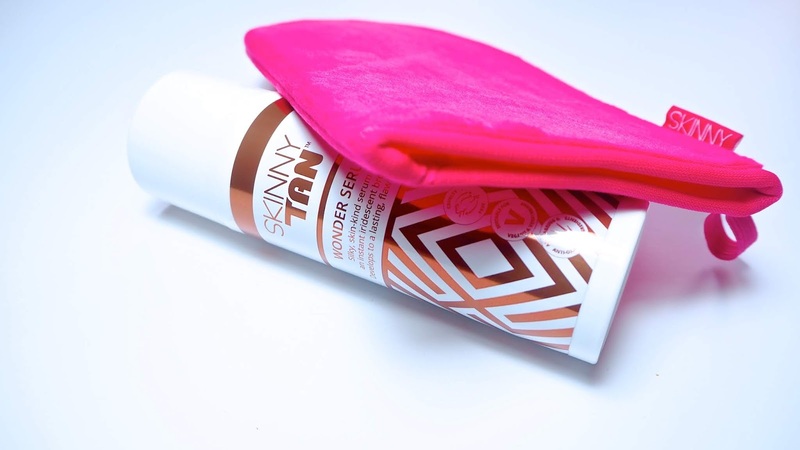 If that sounds like too much or if you can't quite swing it so often with your schedule, Skinny Tan recommends using their Gradual Tanner to top up between applications, something I'm planning to try next time. If you generally spend a night at home once a week (I certainly do! ), this can be done in minutes before you put on something comfy and watch telly. It's a bit of a commitment if you want to keep it going or you could just pencil it in before specially occasions, but honestly, either way the results are so worth it and it's less high maintenance than some other tanners I've looked at in the past that require multiple products, developers, etc. This is one bottle, it's pretty easy and the benefits are great if you're someone who wants to be tan without the risk of sun exposure. I should say, I didn't use Skinny Tan Wonder Serum on my face even though it's suitable to do so. I was afraid it might be too dark and since I wear makeup pretty much every day, I felt that I could match up with a darker foundation and some bronzer. It worked out perfectly, though I did have a bit of a line around my neck that I could easily blend with makeup, but it showed when I went makeup free. Next time I think I will try it on my face and watch it closely... If it's starting to look too dark as it develops, then I'll wash my face earlier than the rest of it and hope for the best. It only lasts about a week on me, so I'm gonna YOLO that situation cause I won't know if I don't try. Skinny Tan Wonder Serum is made with 95% naturally derived ingredients. It's paraben-free, sulfate-free, certified cruelty-free and suitable for both Vegans and vegetarians. 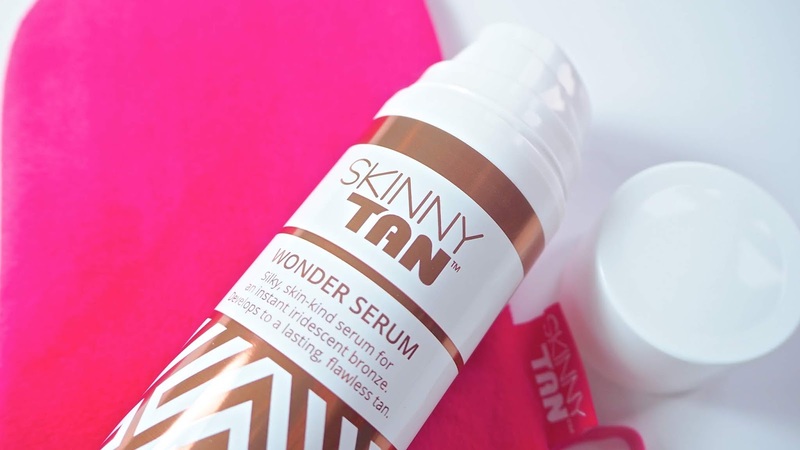 Skinny Tan Wonder Serum retails for £29.99 and you can buy it and find more information at skinnytan.co.uk. If you're new to tanning or to Skinny Tan, there's currently a launch offer than includes all the accessories you'll need for exfoliation and application for £29.99 - it's a bargain! Wonder Serum is also available at Boots on its own where it's currently on sale for £19.99. * Special thanks to Skinny Tan for partnering on this post. While the products included in this post were gifted by Skinny Tan, all views are strictly my own and in no way influenced by the brand or any affiliated parties.